When you’re looking for a taste of something a bit more exotic, flavorful and spicy, Thai food always comes to mind for me! Curries, noodles, seafood and more, Thai cuisine covers a wide and delicious variety of flavors and is often punctuated with extremes of sweet, sour, spicy and hot. 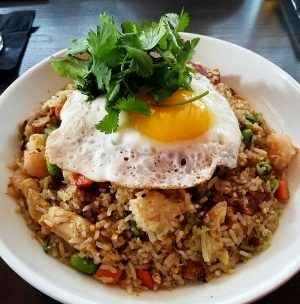 If you’re up for some of the best Thai food in the Triangle, I do have two favorites that are head and shoulders above the rest- Thaiphoon Bistro in S. Glenwood and Sawasdee Thai just past Crabtree Valley Mall. Both dish up exquisite and delicious Thai eats but in two very different types of ambiance. Thaiphoon Bistro is an easy choice if you live in downtown Raleigh. With two entrances on Glenwood Ave and North Street, I prefer North which features a koi pond, outdoor patio and opens up into the main dining room! 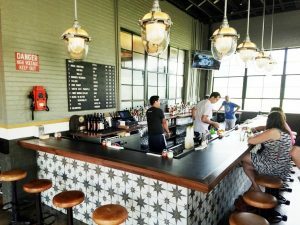 The simple white decor is a change from their orange days and the small bar at Thaiphoon shows off a nice display of liquors. Modern and simple is the best way to describe the ambiance here, you can do a date or dinner party here and feel equally comfortable. I’ve eaten at Thaiphoon probably 10 or 15 times and for some reason never reviewed it. The menu has all your Thai favorites but for my most recent visit, I noticed a couple of newer items including a roti canai so yeah, I’m ordering it. Service at our table is sort of funny, my friend Susan wanted to customize the order and the Thaiphoon server was warning her not to do it and then asked her to promise not to send it back if she didn’t like it! But overall the service here is fine if not super warm. My roti canai starter was pretty solid: a well browned, pretty dense pancake with a thick curry sauce. If you haven’t had roti canai before you should definitely try Thaiphoon’s version. Typically you’ll find this app at Malaysian and Singaporean restaurants. Tear a piece of the pancake off dip into the tasty curry which also has some chicken and potato and you’ve got yourself a taste sensation! Messy but way delicious. My chicken pad kee mao is also decent and well-plated with some colorful hints. The portion size was a bit smaller than I’d expect and the spiciness, on the light side. But still a decent meal. Thaiphoon does a solid job all around and I always grapple with which place serves the best Thai but Thaiphoon is definitely in the top three for me! Moving a bit further north to Sawasdee Glenwood, this restaurant location is in the front right corner of Pleasant Valley Promenade near the BP gas station. Sawasdee presents a more traditional Thai face with a more muted wood interior, wicker furniture and carvings. This is the second location for Sawasdee, the original up on Capital Boulevard is smaller and more casual but both serve good food. Located in a quiet corner of the Crabtree Valley Promenade, Sawasdee opens up to a large space of woods and bright colors. A small raised platform up front with some wicker seating, a side-bar along with 10 to 15 tables in the dining room. The space is open, up to date and comfortable. Light jazz is pumping out of speakers to keep the vibe mellow and chill. We’re celebrating a birthday so it’s time to eat big: Chicken larb, pad thai with shrimp, a red curry along with a catfish in chili-basil sauce get ordered up. The chicken larb starts us off and it’s a great app! White chicken morsels with red onion, lime and more, larb tingles the taste buds and dazzles the palate, nice job Sawasdee. Our fish comes out next and it’s two largish filets in a deep red chili sauce. It’s followed by the red curry with chicken and bamboo shoots along with a nice helping of pad thai with shrimp. The fish in chili sauce is solid but not super exciting, yet it still is tasty. The red curry is excellent with just enough heat, coconut milk and spicing to make it great on rice. The big winner for me is the pad thai with shrimp. Tender rice noodles, shrimp and tamarind flavor along with a pile of crushed peanuts. One other bonus at Sawasdee, the wine prices are super reasonable! Everything is under $30 which is quite a deal for a restaurant. We go with some riesling to keep the heat and spices at bay. Service is efficient although we feel a bit rushed at the end of the meal since they’re cleaning up and closing the place down. But what can I say, but Sawasdee on Glenwood makes me happy. Definitely better than Tom Yum Thai, and I think better than Thaiphoon. There’s something about the execution and spicing here that makes me happy and makes it feel more Asian. So rock on Sawasdee and Thaiphoon! You both deliver tasty, delicious Thai food without much fuss, kup kun krup and bon appetit! You need to revisit Swaswasdee. It’s really gone down hill.